This national park and protected marine area covers 18kms of crenellated cliffs between La Spezia and Levanto. Included within its boundaries are five gorgeous villages, cut off by olive grove cloaked mountains and dry, stoney vineyards. 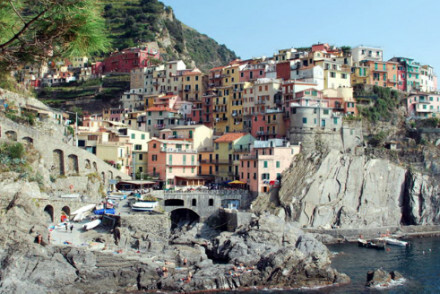 Many of the best places to stay in the Cinque Terre can be found in one of these stunning spots. It may sound like a bare place but these colourful villages, built upwards on the precarious cliffs, are wonderfuly higgledy-piggledy. The ocean is spectacular shades of blue and green. There's plenty of sun and the landscape, while sounding barren, is actually more dramatically beautiful than desolate. Because of its National Park status, cars and motorbikes aren't allowed in the villages and you're spared too many tacky souvenir stalls and fast food outlets. The villages are connected by train but many people actually come here to walk between them. It takes around six hours if you rush, most people take two days. For more information on the routes, check out Walkopedia. National Park status has also helped local producers, whose farms are now protected. So the food is all local and fresh. Riomaggiore is one of the best places to stay in the Cinque Terre if you're going to explore the region on foot. From here a popular stroll will take you to Manorola, then it's two days (or a few hours if you're feeling energetic and it's not too hot) to Monterosso. Riomaggiore, like its neighbours, is small and steep with a charming main street and a pretty marina. Walking past the edge of the marina will afford some brilliant views. If you like peace and quiet then Manarola is the village for you. Most people just walk through, so in the evenings you'll have the place largely to yourself. This is also one of the best places to stay if you enjoy painting. The locals are big on art, and there's a wonderful art gallery featuring paintings mainly of the five towns of the Cinque Terre. Corniglia is the highest of the villages, with two pristine beaches below glittering in rocky coves on either side of the promontory. Vernazza is, for many, the most picturesque of the five towns and one of the best places to stay if you're a photographer! It's the only one with a proper harbour and has been a working fishing village for around a thousand years. There's an ancient castle overlooking the colourful houses clinging to the rocks and an impressive church overlooking the cove and harbour. The town has grown wealthy from fishing and olive growing, and you can see the wealth in the elegance of the houses. Vernazza is also probably the best place for foodies. Apparently some of the world's best olive oil is produced here. Last of the Cinque Terre towns, Monterosso is the only one with a proper beach and large, fancier hotels so is more suited for a resort style holiday. Take the challenge and eschew the train in place of walking between the villages. Wander through the colourful alleys of Riomaggiore village. Visit the gothic church of San Lorenzo located at the top of Manarola. Unwind on the beautiful beach of “Spiaggione” in the ancient Roman village of Corniglia. Be sure to visit the remains of the ancient fortress: the towers of the XI century and the Doria’s castle, the Monastery’s tower of Padri Riformati di San Francesco and the tower Belforte in beautiful Vernazza. With so much on offer it shouldn't be too difficult for you to choose from our list of the best places to stay in the Cinque Terre. 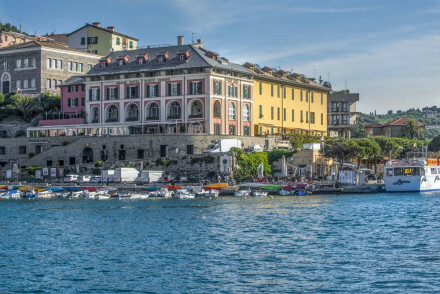 If you like old fashioned charm, the Hotel Porto Roca is one of the most charming .As well as lovely interiors, this hotel has location, location and location and is situated right on the cliffs above the vineyards of Monterosso looking out onto the bay from the large balconies and huge sun terrace. 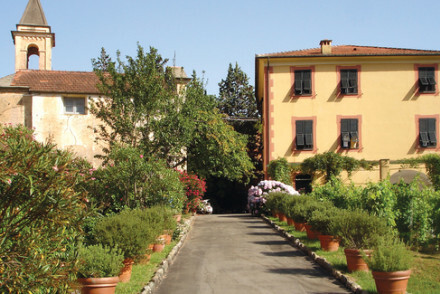 Agriturismo Villanova is a great option for families. This rustic B&B offers a children's playground, tennis court and is just a short hop to the beach. Plus there's self catering apartments for those who want a bit more independence. Hotel Marina Piccola is definitely one of the best places to stay in the Cinque Terre if you're here for the views. It has an excellent restaurant and is just a short stroll to the beach. 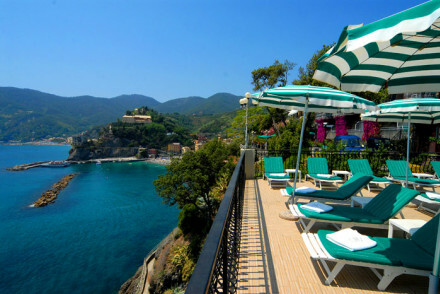 Hotel Suisse Bellevue has stunning views over the Ligurian Sea. It offers simple but comfortable rooms, many with balconies, a private beach and sun terrace. Nestled in the Levanto Valley, La Sosta do Ottone III offers traditional & contemporary rooms with exposed wooden beams and stonework alongside incredible views of the Mediterranean Sea. 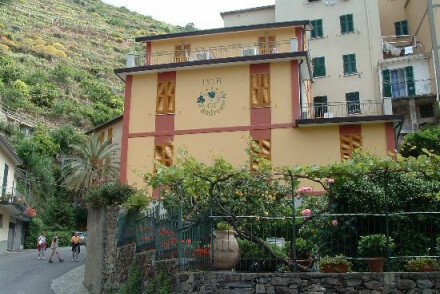 Ca' D'Andrean is a traditional property offering basic accommodation in the centre of Manarola. As well as being great value (rooms start from only €90 per night), the views are fab and there are lots of great seafood restaurants within walking distance. Arriving from abroad, the closest large airport is Pisa International Airport. By train is the best way to reach the area, there’s a local train, the Cinque Terre Express, which runs along the coast between the stations of La Spezia Centrale and Levanto. It stops at all five towns (Monterosso, Corniglia, Vernazza, Manarola, Riomaggiore). Best time to visit - plan your trip between the months of May - October when the days are long and warm (21°C - 28°C). September and October are particularly nice as most of the tourists have left. 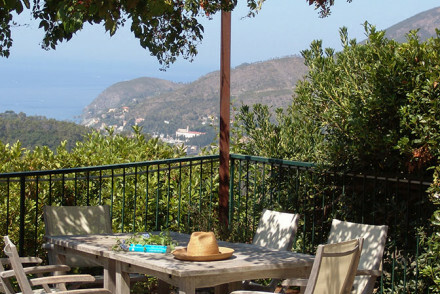 Browse through our list of all the best places to stay in Cinque Terre. 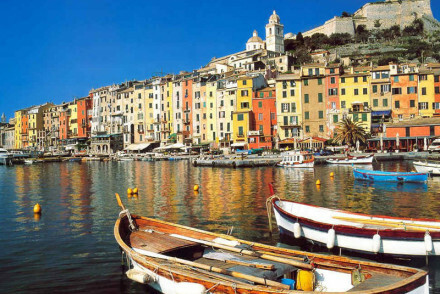 Alternatively widen the net and check out all our recommendations in Liguria.